This summer I started working with a fantastic client on her bathroom remodel. 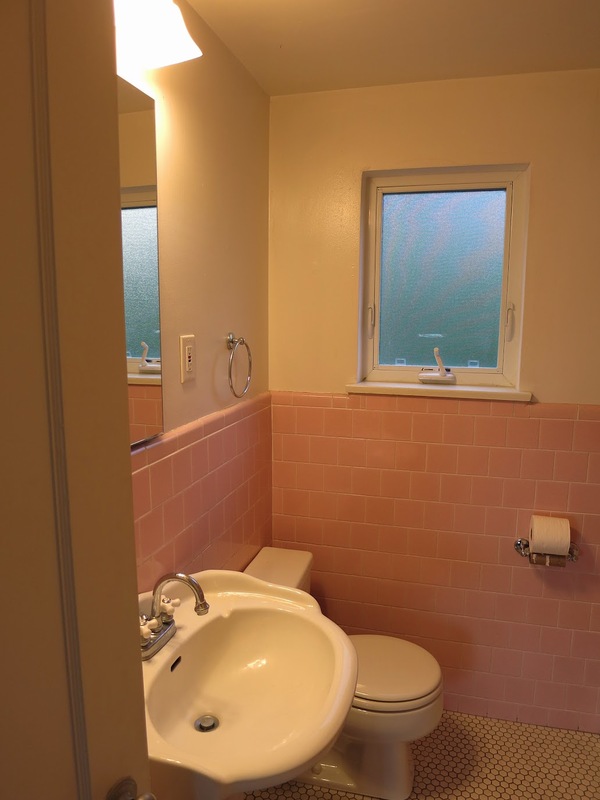 A bathroom remodel had been on her wishlist for years, but seemed daunting (it is) and her work kept her too busy to really dive into the process of picking design elements much less managing a contractor and a construction zone in her only bathroom. It was a dream situation because a) I had just finished my own bath reno, and all the research and sourcing I did was still fresh, and b) because my client has a swift and keen visual eye herself. She knows what she wants, and has great taste. My kind of lady! Plus, she has a killer view of the space needle and downtown from her Queen Anne condo, so the value of this real estate practically blinded me every time I stopped by. Obviously the bathroom had a lot to live up to with that vista just outside. Not bad right? 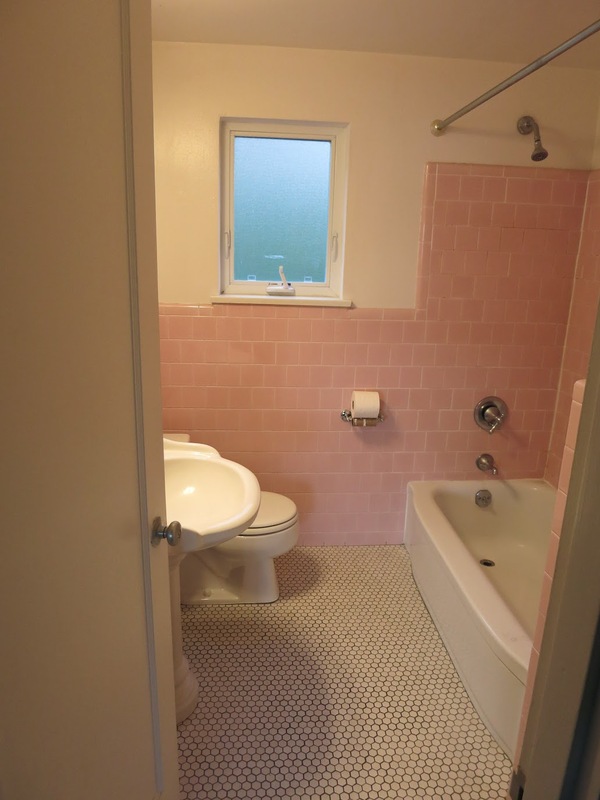 It was the kind of bathroom that crazies on House Hunters would walk into and say "Well, this will need some updating." But definitely not "What were you thinking bland realtor?! This is a deal breaker!" The potential was there for that bathroom, it just needed some self confidence. A lack of character fitting the age of the building, or my client's taste. Tile problems such as cracked tiles, crumbling grout, peeling caulk, and maddeningly askew hex tiles. Unlike our bathroom, the layout was decent (just a really small bathroom) and given that the space is in an upper story condo of an older brick building, there wasn't a lot of room to play with anyway. So, keeping the layout and lifting its spirits. Here were my goals for the Queen Anne bath. Make it pretty. Add architectural charm fitting of the era of the building (late 1930s) and bring in colors and textures that are just unique enough to make it special but will last the test of time. Add/maintain concealed storage. Hidden storage and adding a few extra shelves are very different things. My client and I were so on the same page with this. She was sick of seeing each mismatched colorful bottle of product, typical of a bathroom, all out and about. We both agreed that having more surfaces to "display" the clutter would not be helpful. Instead we needed to replace the pedestal sink and find a vanity that maximized the volume of space, so all the bits and bobs can be shut away. We also toyed with adding a second medicine cabinet, or a shelf with baskets, but in the end the vanity provided enough new closed storage. Make the most of the budget. Obviously. Balancing aesthetics with cost is an enormous part of the process, and really the part that takes the most time. I can decide pretty quickly what kind of sink will be the best, but I am compelled to research the heck out of it to find the best price to quality ratio. Find a dark and narrow vanity. My client had been collecting bathroom images that were speaking to her, and this was the one clear and specific design element she was loving. But with the toilet on one side and the swing of the door on the other. Oh, that and white wainscoting! In our initial consultation, one inspiration note we hit was the modern naturalism of Aveda salons. They use a lot of warm woods, and tonal colors but keep it clean and sleek. That tidbit plus the style of her open kitchen nearby (warm craftsmen cabinets and dark granite), led me to this first board. It included the narrowest vanity, so I added this rolling cart that could be used for her hair dryer etc. Ummm, it is real hard to find dark colored, reasonably priced vanities with ample storage under 25" wide. So I suggested the mini version of our vanity with a coat of black paint. There is no better bang for your buck that this vanity, let me tell you. So, in this board I added those goose-neck sconces to compliment the curvy sink apron. The dark sconces are also a nice visual balance to the black vanity. After this initial pass, we took the most elements from the "light and bright farmhouse" board on to the next design round. Many more iterations of this board were created with more lighting options and plumbing fixture combinations. We played with lots of different faucet options, but decided on that, and shower kit pretty quickly. The longest design strageler was the lighting. Ultimately, the lighting was determined by the size of the bathroom. Between the medicine cabinet and where the swing of the door met the wall, there was only a sliver of space for a hanging pendant. And although I found some cute itty-bity pendant options, it just would have been a nail bitter every time you swung open the door. So we opted to do an over the cabinet light, and found one that had a lot of great character. Just the classiest bathroom ever. Now, to be honest, we didn't decide whether to go light or dark gray on the walls until much father along in the build phase, but since the final result is dark, the final board need to be dark! Ok, now you have the style and elements all settled into your brains. 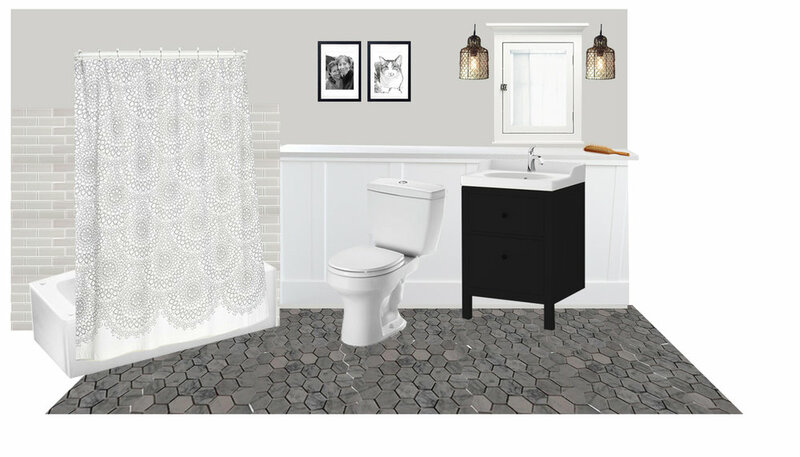 But, it might be confusing how this all fits into the bathroom, so I whipped this little model up on SketchUp to help us all see how the space works, and to prep you for the next post... The Construction! Very exciting. Talk to you then!